Enjoy the wonderfully relaxed and graceful lifestyle of Provence during this three-week immersion program in Aix-en-Provence. Live like a local as you learn about France’s culture, history, cuisine, and language. Smithsonian Journeys offered a once-in-a- lifetime experience with their Living in France program. The hotel/apartment was perfect for a long stay, the tour director was exceptional, provided meals were very good and excursions were hosted by knowledgeable local experts. Although I traveled with a friend this time, this kind of tour makes single travelers very welcome. I will be going on another Smithsonian tour! If you want one of the greatest experiences of a lifetime take this trip. You will see things you could have never thought possible. It will change your life. It has mine. The Living in France tour gave us the opportunity to get to know a very beautiful and fascinating region. The length of the stay meant that we could set our own pace and have many wonderful experiences without feeling rushed. Aix-en-Provence captured my heart with its beauty, historical charm, walkability, and friendly people. The Smithsonian Journeys Program is so well organized and well managed that the traveler can relax, absorb and enjoy the culture and language. The hotel is well located within walking distance of everything, with nice accommodations and very friendly staff. Save $250*per person when you book by May 10, 2019! Provence. The very name evokes images of idyllic days of dazzling light illuminating the countryside’s lush olive groves and sloping vineyards. It was the same colorful scenery and light that drew artists such as Cézanne, Chagall, and van Gogh to this region. On this special immersive cultural stay in Aix-en-Provence, let this charming small city, which boasts a 600-year old university and numerous art and cooking schools, become your home for three weeks. You’ll stroll elegant cobblestone streets on your way to class or to a bustling outdoor market. Explore medieval hilltop villages, Roman ruins, and the lovely countryside. Plus, linger over a glass of wine at a neighborhood café and dine in restaurants that few tourists could hope to find. Stay in an apartment at the Adagio Aix-en-Provence Centre, located on a peaceful street near the shops along Cours Mirabeau. Excursions, Day Trips, Presentations: Take an in-depth walking tour of Aix-en-Provence led by an expert guide. Learn about the region’s history as you explore greater Provence during day trips to Avignon and the Pont du Gard, Marseille, and the Luberon Valley. Plus, enjoy a wine tasting and attend sessions on history and art by a local expert during your stay. Local Experts: Enjoy learning from local experts who share their knowledge of art, history, and culture and join you on select excursions. Resident Director: An engaging and resourceful resident director handles logistics and helps you plan your free time. Special Enrichment Tracks: Personalize your experience with special enrichment tracks (at an additional cost). Take one or all three! Language Lessons: An immersive course tailored to your skill level. Cuisine: Interactive cooking demonstrations, classes, and shopping excursions. Art and Architecture: Additional site visits of artistic and architectural significance. Social Connection: In addition to group activities, you’ll enjoy the camaraderie of convivial gatherings of Smithsonian Journeys travelers as well as many group meals throughout the program. Yet you’ll also enjoy the independence of heading off to explore or dine with a smaller group of new-found friends. Apart/Hotel: Stay in an apart/hotel centrally located in the historic city center. Accommodations offer satellite TV, complimentary Wi-Fi, a well-equipped kitchen, plus a friendly, helpful staff and other services—combining independence with easy support services. Day 1 – Depart the U.S. Depart the U.S. on your overnight flight to Marseille, France. Upon arrival in Marseille, transfer to the centrally located Adagio Aix Center. 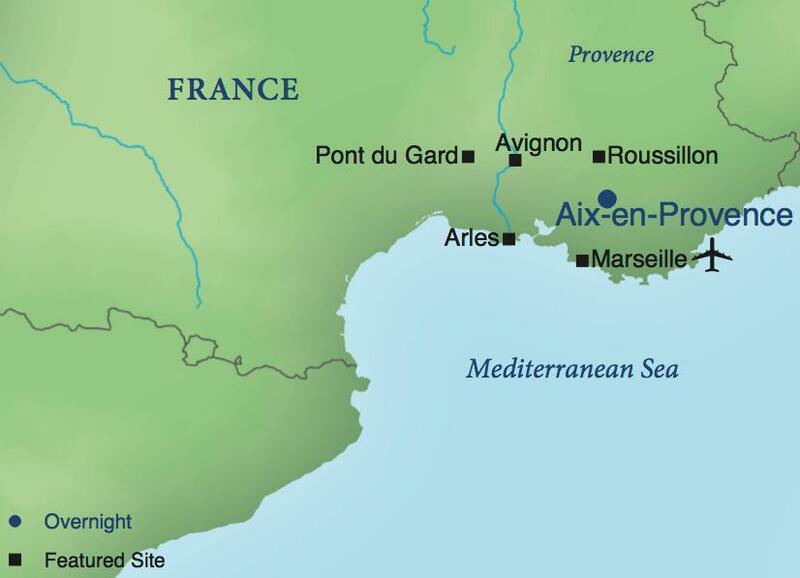 Upon arrival at the hotel, each guest will receive customized Welcome Kit containing general information about Aix-en-Provence, as well as a map of the city. A continental breakfast will be served this morning at the hotel. Later, a local expert will give an engaging talk on the history and cultural heritage of Provence. Explore Aix on a walking tour to see the Fontaine de la Rotonde, and the Fontaine des Quatres Dauphins. Walk through the Old Town where you’ll see the Town Hall and the Cathedral St. Saveur. If you selected Track 1.1, the Language Option you’ll begin the day with a tour of your language school to meet the staff and begin French lessons. Language lessons continue for those participating in the Track 1.2 Language Option. Gather for lunch at a local restaurant. Get together with fellow travelers for lunch. Track 3.2 Art and Culture Option participants will visit remarkable castles and abbeys of Provence. Visit the Silvacane Abbey and Lourmarin Castle. Track #2.2 Culinary Option you’ll get an understanding of the basics of French cuisine during an engaging lecture, cooking demonstration and tasting. French lessons continue for those in the Track 1.3 Language Option. Early this evening, a local expert will speak on The Art of Provence. French lessons continue for those participating in the Track 1.4 Language Option. For all others, the day is free to explore on your own. Follow your own path today and visit the market on your own. Track 3.3 Art and Culture Option participants visit the Cezanne Studio and home at Lauves. See Saint Victoire Mountain, a favorite subject of Cezanne. Travel today to Avignon, a World Heritage Site, located on the banks of the Rhône River. Tour the remarkable Palace of the Popes comprised of two very different style buildings. The austere Old Palace built by Pope Benedict XII; a dour man, and the New Palace built by Pope Clement VI, a jovial Pope and decorated in accordance with his personality. Track 1.5 Language Option French lessons continue this morning. Track 1.6 Language Option instruction continues. Track #2.3 Culinary Option learn to create a traditional three-course menu featuring popular French and Provençal specialties. Afterward, sit down to enjoy the meal you’ve created. Other travelers have the entire day at leisure. Track 1.7 Language Option instruction continues. The balance of the day is free to follow your own path. Track 1.8 Language Option language instruction continues this morning. The rest of the day is at leisure to explore on your own. The entire day is free of planned activities. Let your interests be your guide and explore on your own. The Smithsonian Journeys Travel Director will be able to assist with advice on independent travel planning. Depart on a full-day excursion to the fascinating Mediterranean coastal port city of Marseille. See the city’s attractions and marvel at the panoramic views from the hilltop Notre Dame de la Garde Basilica. Track 1.9 Language Option instruction continues this morning. Track 3.5 Art and Culture Option participants will explore the many fountains and courtyards of Aix-en-Provence. These fountains have a story to tell and grace the squares, courtyards of private mansions and the Cours Mirabeau. This evening, gather in the Smithsonian Travelers Corner. Track 1.10 Language Option continues this morning. Track #2.4 Culinary Option participants will learn how to pair a variety of French cheese and wine. The day is at leisure so you can explore on your own. Day 23 – Depart for the U.S.